The bonus that came from rescuing the Red Barn Bees last Monday was the huge amounts of honey that was part of that cutout. The honey stores in this hive were so vast they were split four ways amongst the three beekeepers and the bees. Since this is prime season for collecting nectar and pollen it is safe to take some honey from the little winged alchemists. The preferred method of honey extraction for the niche bee keeper is the crush and strain method demonstrated at the end of this video of Kirkobeeo. 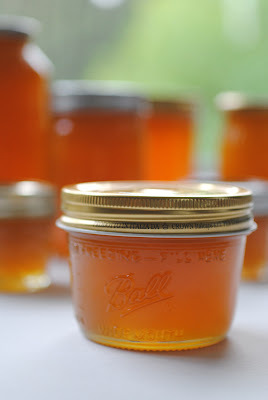 I used a variation of this method and so far have eleven glass jars of honey! Honey flavor varies according to the location of the hive and where the bees forage. Although I am no expert, yet, in honey flavor, I would guess this hive foraged among Eucalyptus, Buckwheat and Sage due to a slightly menthol note and the brilliant orange color. Next on the agenda is the task of "rendering the beeswax", which is even more complicated than extracting the honey. Oh joy! The beeswax is intended for the solid aspect of the upcoming Bee perfume which is in formulation. Read more about honey at this post from Perfume Illuminated series. Honey notes in perfumes I have created are most apparent in the perfume devoted to Peace and Vera, albeit there is no honey in either perfume. How interesting and I bet that honey is delicious! Hey Rose, how lovely that you stopped by for a visit. Let me make you some tea with honey while your here.